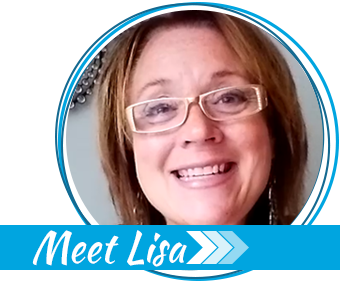 Guest post by Julie Sczerbinksi who blogs at Home Ready Home. 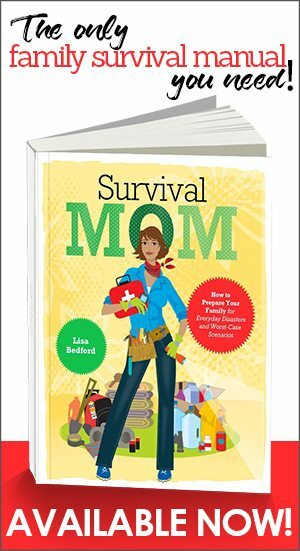 Riding in the car, on the way to a beach vacation, I listened to Lisa, The Survival Mom tell her radio show listeners that children can sleep through fire alarms. Right then, I had no idea that 2 nights later, on the 7th floor of the Marriott Hilton Head Resort and Spa, I’d have the chance to put her statement to the test. On Friday night, around 11 pm, I was jolted awake by a deafening buzz. It took me less than 3 seconds to identify the sound. A fire alarm. False alarm, I thought. Every fire alarm I had encountered—like at school and work—was a drill. Immediately, a man’s voice blasted into the room. “Please exit the building using the nearest stairwell. Do not use the elevators,” he said, repeatedly. I jumped out of bed and fumbled with my shoes. My eldest daughter was already on her feet. “Put on your shoes,” I said, as I crossed the room and grabbed my phone and room key. After shaking her until she awoke, I quickly explained that we needed to leave the room. Then, my husband, daughters and I rushed out of the room, into the hall, to the nearest stairwell, down 7 flights of stairs, out the front door, and into parking lot, where we waited for the next 45 minutes with more than 3000 other guests. Thankfully, the hotel was never on fire. In the morning, we learned a transformer had blown. Half the hotel (not our half, luckily) had lost power. 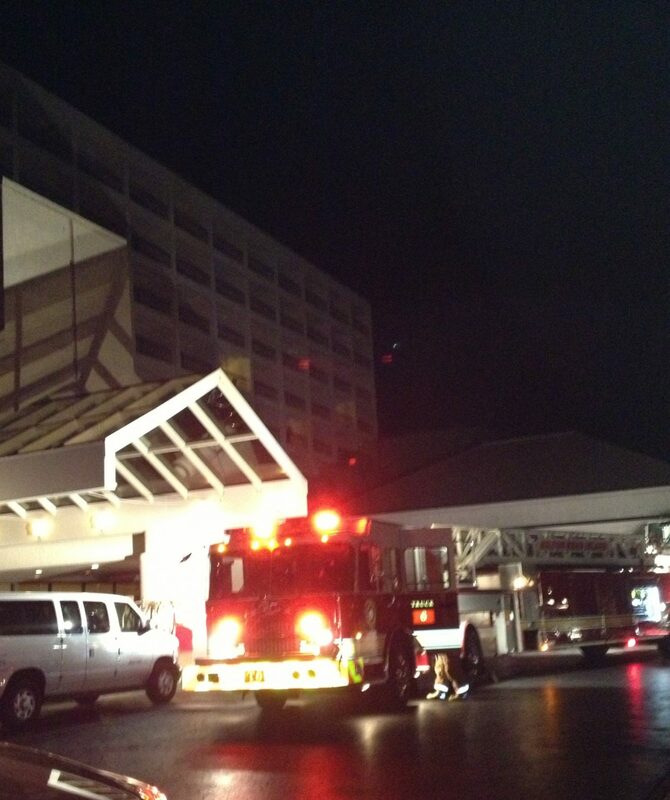 When the hotel’s generator kicked on, the exhaust set the alarm off. Now, as I reflect on the experience, I see where I could have done better. 1. Don’t avoid discussing hotel fire safety with your children. Honestly, it never crossed my mind to talk my kids about hotel fire safety. I mean, here we are at the start of a fun family vacation, and the last thing I want to be is Debbie Downer, bringing up all the things that could go wrong. Trust me, parents, you have to. During the evacuation, the girls were frightened to the point of tears. Yes, the situation was scary, but I can’t help but think that if we had talked about what to do in a hotel emergency, they might have been a little less panicked. And I don’t even want to think about what would’ve happened if they weren’t with me when the alarm went off, or if we had somehow gotten separated during the evacuation. The bottom line: Hotel fire safety is a discussion you need to have with your kids before you go on vacation. 2. Don’t forget to pack a flashlight. In a lifetime of hotel stays, I’ve never once packed a flashlight, but I will now. Since the emergency, I’ve thought a lot about the guests on the power outage side of our hotel who had evacuate through darkened hallways and stairwells. 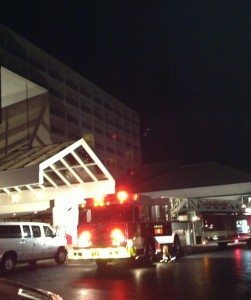 The reality is, a fire can knockout the hotel’s electrical system and you might have to navigate the hallways in the dark. So, have a flashlight handy (put it on the nightstand before you go to bed) or at the very least, make sure you’ve downloaded a flashlight app on your smartphone. 3. Don’t put off locating the two nearest stairwell exits. Initially, I was proud of myself as I thought I had gotten this one right. First thing, after setting our bags inside the room, I studied the map on the back of the door and figured out where the nearest exit was. I only memorized the way to 1 exit. What if that exit door was locked or the fire prevented us from accessing it? Remember: Two is one and one is none. Always have a back-up. 4. Don’t forget to walk the route to the exits and test the doors to make sure they open. It isn’t good enough to just look at the floor map on the back of the room door. Walk to the 2 exits closest to your room. Count how many doors you pass on the way there. Make a mental note of landmarks— such as trash cans, or vending machines. Why? In a hallway filled with smoke, you may be crawling and doors and landmarks are all you’re going to have to guide you to safety. Finally, try each exit door and make sure it’s unlocked. 5. Don’t put off determining a family meeting place outdoors. An hour before the alarm sounded, my husband was at a dinner function in the 1st floor ballroom. Luckily, he was back in our room and our family was together at the time of the alarm. But several people we knew at the hotel were still at the function, separated from their family during the emergency. I listened to their stories of trying to find their family members in the chaos and made a promise to myself: always agree upon an outdoor family meeting spot before check-in. 6. Don’t assume it’s a false alarm. Yes, it could be a false alarm, but what if it’s not? Treat every alarm like it’s the real thing. 7. Don’t forget to place your shoes on the floor next to the bed. I fumbled with my shoes. My husband had to cross the room to find his shoes. One of my daughters had to be reminded to put her shoes on, and in the confusion, my other daughter left the room shoeless. When we got outside, she wore my shoes and I walked barefoot across the parking lot. It’s very unsettling—walking along in the dark, worried that you’ll step on something that can cut your feet. Once we were safely back in our room, the first thing we did was to put our shoes next to the bed. 8. Don’t lose track of your room key and car key. On the way out the door, I grabbed the room key, but it wasn’t until we were in the parking lot that my husband and I realized we’d left both sets of car keys upstairs. Luckily, the hotel didn’t burn to the ground, but if it had, we would’ve had a heck of a time getting back home. The next morning we learned that a few friends had forgotten to take their room key and when they left, the door locked behind them. What would they have done if the exits were filled with fire and smoke and the safest place was back inside their room which they now couldn’t get into? It’s good practice to put your room and car key on the nightstand every night before bed. If there’s an emergency, everything you need will be within arm’s reach. 9. Don’t rush out the door. Because we were rushing to get out of the room, we forgot one important step in hotel fire safety. We never felt the door before we opened it to see if it was hot. If it had been and we opened it, we may have put ourselves in more danger by letting smoke or fire into the room. Always feel the door before you open it. Experts suggest using the back of your hand to feel for temperature. Otherwise, if the door’s hot, it may burn your palm, making your hand unusable. On a scale of 1 to 10 (with 1 being as cool as a cucumber and 10 being”Have you seen my mind? I seemed to have lost it.”), I’d rank my panic meter a 4. And honestly, it probably would’ve been much higher if I had seen smoke or flames. But remember (and I’m reminding myself here, too), keeping your wits about you will help you make life-saving decisions. And to help hold panic at bay, always be prepared and have a plan to deal with a hotel emergency. 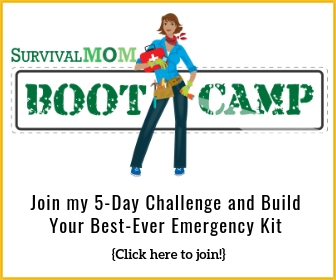 Julie Sczerbinski blogs about preparedness from a newbie’s point of view at Home Ready Home. We have a family tradition that would help us in a hotel fire – we never take the elevator DOWN (except for carrying bags when checking out). As a result, we quickly get familiar with all the fire exits and stairways in area of our room, and usually all over the hotel as well. Excellent points! I have always told my kids and everyone else who will listen- when you come into a store, concert hall, nightclub or hotel, find the second exit, the one you did not come in through, because in case of a panic, that’s where everyone will go with devastating results – read about The Station Club Fire or the Iroquois Theatre Fire for gory details. Find at least one more exit, walk up to it and touch it, don’t just see it from across the room. In a lot of the more modern hotels, the emergency stairwell leads directly to the outside and the exit door locks behind you. This means you will be out on the street, maybe in a back alley. Make sure you are dressed for the weather outside if you have the time to do so. And take your important stuff like IDs, money, credit cards, etc. with you because you may be locked out for a while and have to find food and lodging elsewhere. This is coming from a retired Fire Captain. Very excellent points, including the comments. Number one should be, only stay in fully spinklered motels or hotels. Also remember a ladder truck only goes up to the ninth floor, if they can get close enough to the building. Never ignore a fire alarm system. Stay fire safe. Change your smoke alarm and carbon monoxide batteries every year. This is good for a person like me who doesn’t travel very much. Important things to remember. Also probably good to use some of it for your home safety too. Like the shoes near the bed, the keys where you can get to them, etc. I never thought of that. If something happened in the middle of the night, I would not know where everything was. Maybe making a habit of keeping shoes at the end of the bed and keys on the nightstand would be a great idea! Always on the nightstand, right next to a flashlight. Great tips! Nothing like the voice of experience to help the rest of us get better prepared. We used to travel occasionally with small children and when we’d stay at a hotel we’d bring outlet covers and nightlights. Now the kids are big enough to not need child-proofing but a staple in our hotel gear is an emergency flashlight, the kind that you plug into and when the power is lost it turns on instantly. 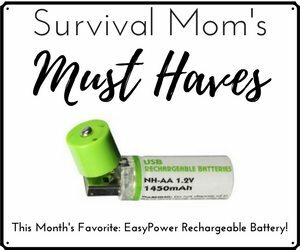 No fumbling with trying to find flashlights or turn on the phone light. The only downside to this is that you have to remember to not leave it behind so now we put a “Get Flashlight” sticky note on the door of the room so we’ll remember to grab it on the way out. #6 reminds of one time I was at a convention listening to the keynote speaker when the fire alarm went off. They told us all to remain seated while they figured out what was going on and that is was most likely a false alarm. There were hundreds of people in the room, all in business attire (high heels for the ladies, etc.) and we were several stories up. I calmly headed to the emergency exit with a few dozen others and went outside until the all clear. I wasn’t taking chances. It would have been a disaster if it turned out to be a real emergency. Grab wet washcloths to put over your mouth. You should always carry a mini flashlight on your key chains. Check door with the back of your hand before exiting. Count the doors going either direction to stairs so when your on the floor crawling through smoke, you know how many more doors to go. When you enter the room, don’t put your luggage on the bed. Rather, get out that flashlight, pull the sheet & fitted cover off the mattress corner, and check for bed bugs. Also, bring a gas mask & head lamp for each person. This came up in my Facebook feed and was a timely post to read since our family is soon going on vacation. I shared it with my husband, and we’ll be changing some things we do at the hotel. Thanks.